Well since you already know I’m not a romantic you might be questioning this post. Just because I’m not romantic doesn’t mean I don’t like pretty things! 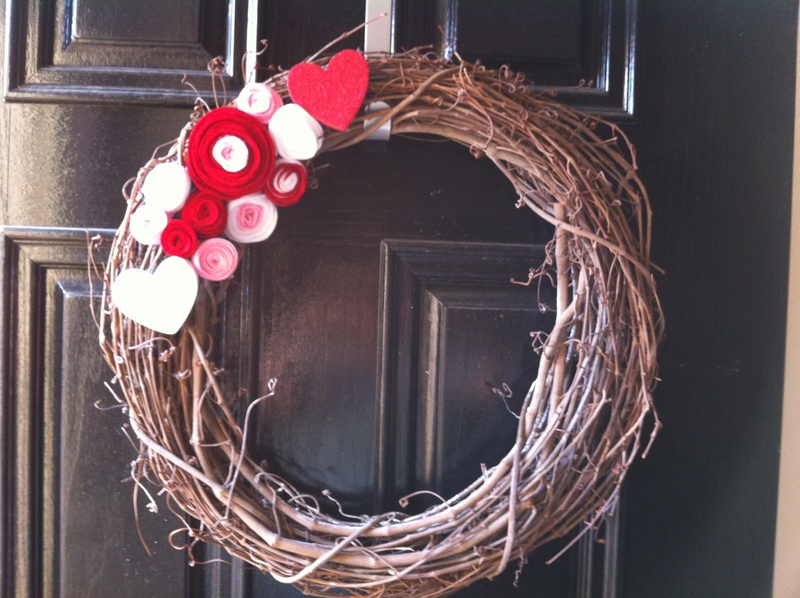 We took our Christmas décor down about the 2nd weekend of January and left a bare grapevine wreath on my door….which stayed for about 1.5 weeks….irritating the crap outta me!!! We had car trouble and I was just exhausted from it all……nothing was getting done! So finally last week I decided to make some felt flowers that I saw on Pinterest. 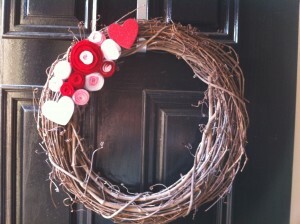 I had scrap felt, the wreath, a hot glue gun…so my cost would have been $0.00 but I was browsing walmart that morning and saw a 4pk of large glitter foam hearts and loved them and they were only 97¢! The wreath took me about an hour to make. It’s simple, sweet, and I love it!. So I love cake (mostly milk chocolate)! 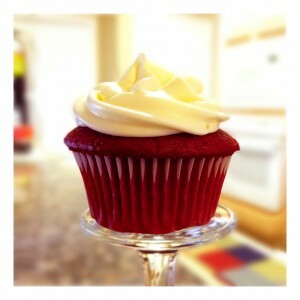 I love getting a black and white cupcake from Sprinkles or a red velvet cupcake from Red Jett Sweets. But they are both far from me and I just can’t drop everything and drive to Dallas or Fort Worth. So since I do like to bake I decided to make cupcakes this past Sunday. I like to keep it simple when it comes to baking. If I’m making a cake/cupcakes I usually use a box mix and make the frosting. Why make it difficult and time consuming when you just want a dessert! You can still make it look fantastic! I used a Duncan Hines red velvet cake mix and made 24 scrumdidillyumptious cupcakes. I used this frosting recipe. It’s yummy but it doesn’t taste like Sprinkles to me…but that’s ok. I don’t really like frosting anyway so I’m not a good judge when it comes to that, lol!!. I’ve done the work in office thing for many years (health insurance) and when my son Jayson was born I quickly decided to stay at home….daycare for 2 lil ones was very expensive. Little did we know that I would need to stay home with the kids. 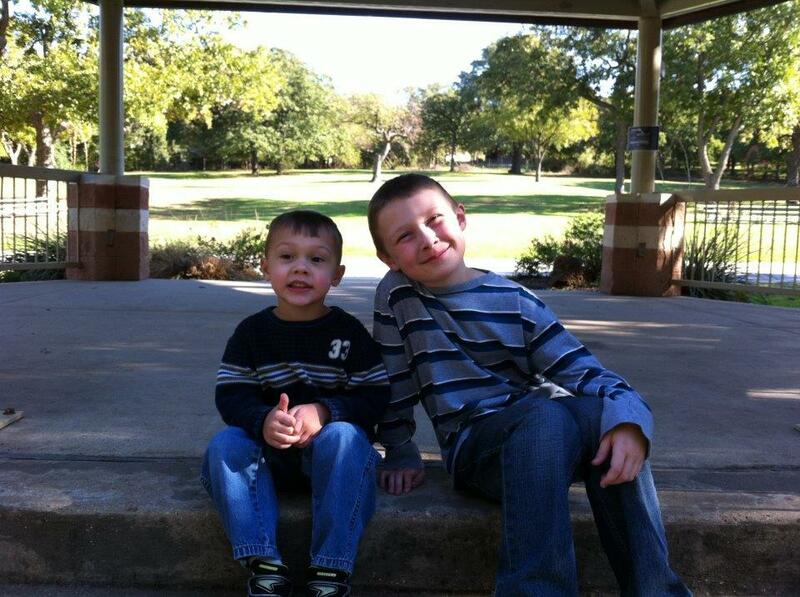 We noticed that Jayson was having some developmental delays around a year old. We thought it was because I stayed home with him and we didn’t get out much. I joined playgroups and tried to get out more and nothing seemed to help, he would just separate himself from the group. That’s when I decided to go back to work. But not just any work…I wanted to work in daycare (did that several times and LOVED it). Mostly because he could be there with me and I could see his development and bonus a discount so it wasn’t going to cost as much. But he wasn’t developing much. I made that dreaded call to Early Childhood Intervention (ECI) and boy was that one of THE BEST things I could have ever done! Most of his therapy took place at daycare and we started seeing an improvement right away. The bad part was he was only accepted to the age of 3. He was already 2! But then more great news came….there was a school…free of charge in the ISD we live in that he could attend…if he qualified. Then worry hit again…would he qualify?! That day came and he did qualify. According to the tests and forms we had to fill out is when we finally had conformation that yes…Jayson is Autistic. So we now start our new way of life….our new journey.. I am a clean and organizational freak!! I like my house clean and in order. I do the cleaning and laundry when needed and even write down our weekly dinner plans on the fridge (love that the kids can read it now…no more what are we having for dinner chats). My day begins at 6:30 in the morning and usually ends around midnight. Although I’m not that busy during the day I’m pretty busy shuffling kids around to/from school/work so that actually takes up more time than anything. My 3 yr old goes to an Early Learning Center (for his Autism) and has to be there at 8am and gets out at 11am. My 7 yr old is in 2nd grade and has to be at school at the same time (hubbs takes him to school on his way to work). My 18 yr old works at Kroger and has a different schedule every week. Then you know the drill once everyone’s home it’s snack, homework, play, dinner, baths, and bed! Once the kids go to bed I find myself doing the things around the house that need to get done (only I find that they need to get done though) or I stay up watching movies with the hubbs. Speaking of my hubbs….his name is Bryan and I love him very much! I know I don’t show it as much as I probably should but that’s where the shocker comes in….I’m NOT a romantic (people seem to think I am…not sure why). Sure I like flowers occasionally but I’m more the person that likes to play around and tease..